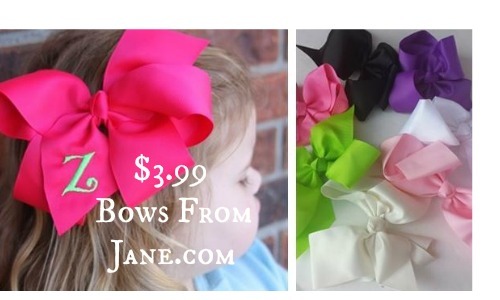 Jane.com is offering large monogrammed hairbows for $3.99. Choose from several different bow colors and thread options. Each bow is 6 in. and can be customized with one initial. These are great for adding a pop to any Spring outfits, so stock up for the little ones in all your favorite colors. Limited quantities through 4/22. Shipping is $2.49 for the first one and 99¢ for each additional bow.